Travis Feeney was an all-Pac-12 second-team selection in 2015. 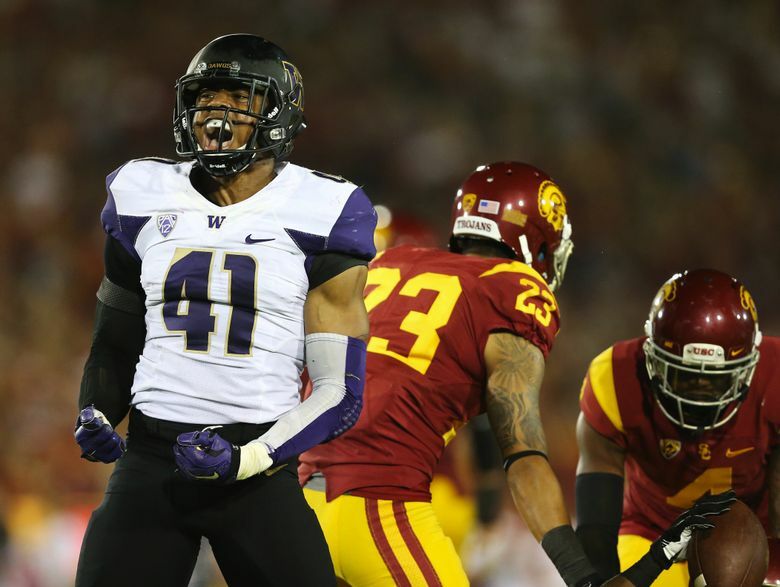 Travis Feeney became the first Washington Husky selected in the 2016 NFL draft when the Pittsburgh Steelers picked him in the sixth round (No. 220 overall) on Saturday afternoon. He had to wait longer than he would have liked, but Feeney wound up at a place he’s sure he will love. Feeney was back home in the Bay Area when his phone finally rang. It was Steelers coach Mike Tomlin, but Feeney initially thought it was a prank. ”I was sitting at home thinking nothing was going to come,” he told Pittsburgh reporters. His reaction to going to the Steelers? “It’s freaking awesome,” Feeney said. A 6-foot-4, 230-pound outside linebacker, Feeney was an all-Pac-12 second-team selection in 2015, when he had a team-best eight sacks and 17.5 tackles for loss, ranking third in the Pac-12 in both. Draft projections had Feeney going anywhere from the second to the seventh round. The Steelers’ Northwest-area scout is former UW tight end Mark Bruener, a first-round pick by Pittsburgh in 1995. The Huskies had a program-record three players selected in the first round last year (Danny Shelton, Marcus Peters and Shaq Thompson), and Hau’oli Kikaha then went in the second round. The sixth round marks the latest that a UW player has been the school’s first pick in an NFL draft since 2000, when defensive end Jabari Issa (Arizona) was also selected in the sixth round. The Huskies did not have any players drafted in 2003, 2008 and 2009. Elsewhere, former UW wide receiver Jaydon Mickens and Marvin Hall have both agreed to free-agent deals with the Oakland Raiders, and tight end Joshua Perkins has agreed with the Atlanta Falcons. There was no immediate word from other former UW draft hopefuls such as Cory Littleto or Taniela Tupou.